Currently using ProTools 10.8 professional recording software on a Mac-based system with a Mackie 48-8 desk and KRK V88 main monitors. 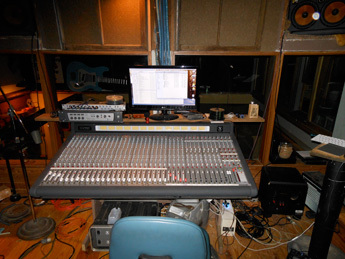 Outboard gear includes Focusrite, Trident, Valley People, DBX, Crown Lexicon, Presonus and more. Microphones by AKG, ElectroVoice, Sennhieser, Apex, Shure, Rode, Octava. A decent Kimball upright, Hammond M3 organ with a Leslie 147 cabinet, Alesis 88-key controller, Yamaha Rock Tour drums, various acoustic and electric guitars( featuring a Guild Starfire electric c.1977 formerly owned by Son Seals).